We are so fortunate to know this wonderful young lady, C.T., in our company. She is brilliant and absolutely beautiful inside and outside. She was the first person to place an order as we start our venture. 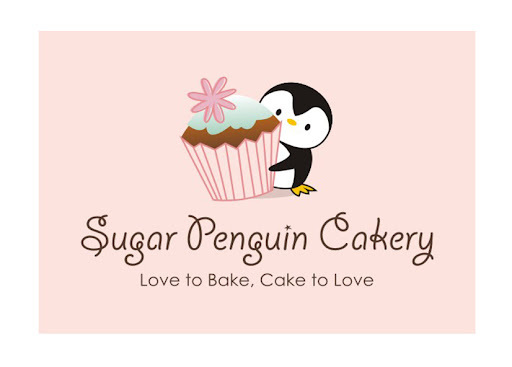 She encourages us and we value her input toward the business. She just celebrated a birthday and her husband wanted to get a cake for her birthday party. 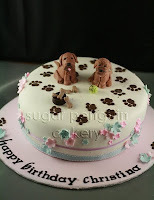 The husband wanted to have their beloved dogs, Murray and Nugget to be on the cake. It was not easy to design a cake with dogs on it and making sure that it's CT's birthday, and not the two doggies. For the longest time, I can't get my head on the designs of how the cake should look like. One of the afternoon, it just hit me... I can blame it on the dogs! So, I came up with the design of a very lovely, pretty cake, with ribbons and flowers, then I'll put some paw prints and some 'dirts' all over the cake, as of they were stepping all over the cake! Brilliant! Here's the picture of the 'boys' on the cake. The boys are made from gumpaste and the dirt are from the cocoa petal dusts. As for the details, I put dirty tennis ball and a dog bowl, filled with dog biscuits, also made of gumpaste.